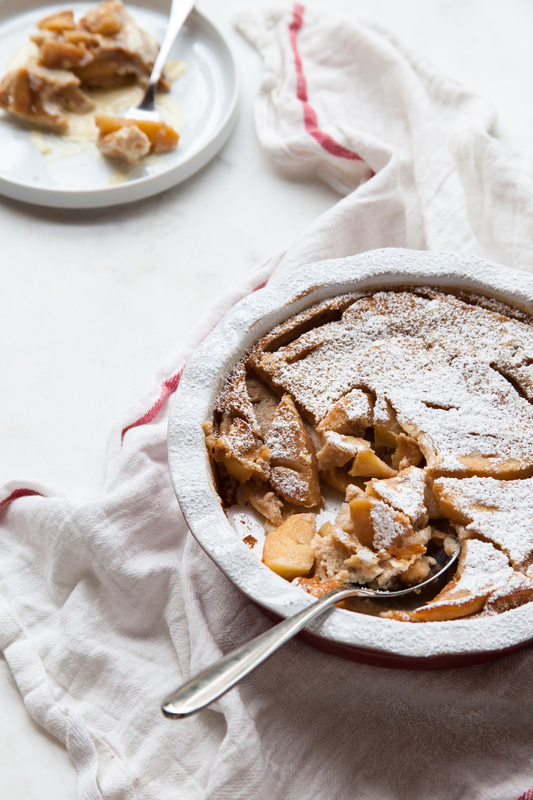 Instead of apple pie this season, why not try a French Apple Clafoutis? An apple cla-what, you say? Kla-foo Tee! Over a dozen years of classical ballet training (where a majority of the terminology is in French), 2 semesters of French in college, and nearly a decade studying pastry and I can hardly pronounce any of the words correctly myself. But, clafoutis - that I know! Typically made with fresh cherries, clafoutis is a fruit-studded, egg-based custard that is baked up like a cake. It is like a cross between a flan and a giant pancake! Clafoutis is sometimes made with berries, stone fruit, and apples. 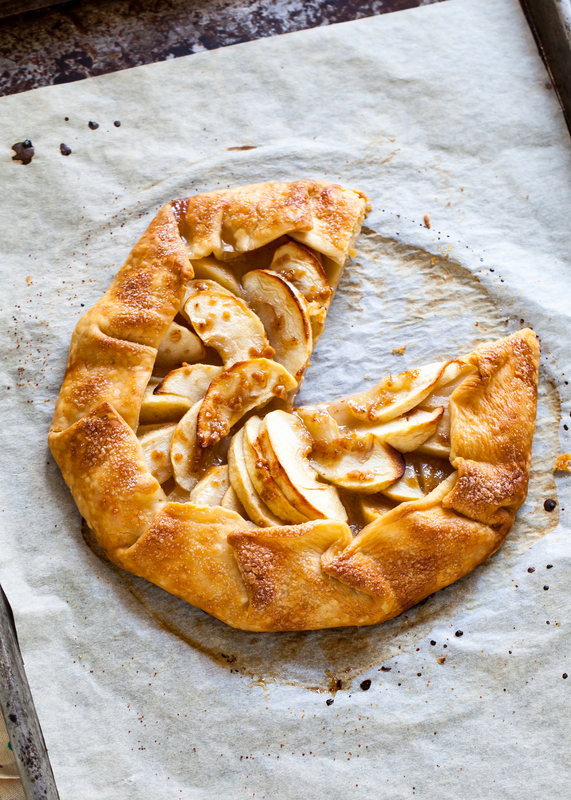 Instead of painstakingly rolling out pie dough and meticulously weaving a lattice crust, make this apple dessert this holiday season. My version of this french dish (to be served for dessert, breakfast, or if you ask me - with tea) is infused with cinnamon and smothered in vanilla-specked créme anglais. If you think you will miss the richness of buttery, flaky pie crust, but you can rest assured knowing that the creamy, velvety clafoutis with rich créme is plenty decadent. Preheat oven to 375 degrees Fahrenheit. Butter a 9 to 10-inch pie pan or baking dish and set aside. Toss the apple slices in the lemon juice and place in a medium saucepan or skillet. Add the butter and cook over medium-high heat for a few minutes. Add the brown sugar and cinnamon. Continue to cool until the apples are soft. Remove from the heat and set aside. Whisk the eggs, seeds of the vanilla bean, and sugar until pale in color. Gradually stir in the flour and salt. While stirring, add in the sour cream and milk until combined. Pour half of the egg mixture in the pie pan. 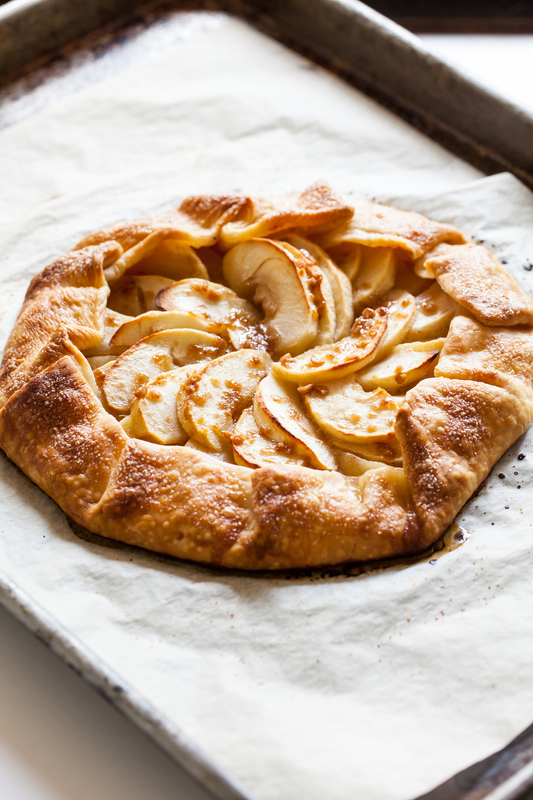 Bake until the clafoutis is puffed, golden, and the center is set (about 35 to 40 minutes). 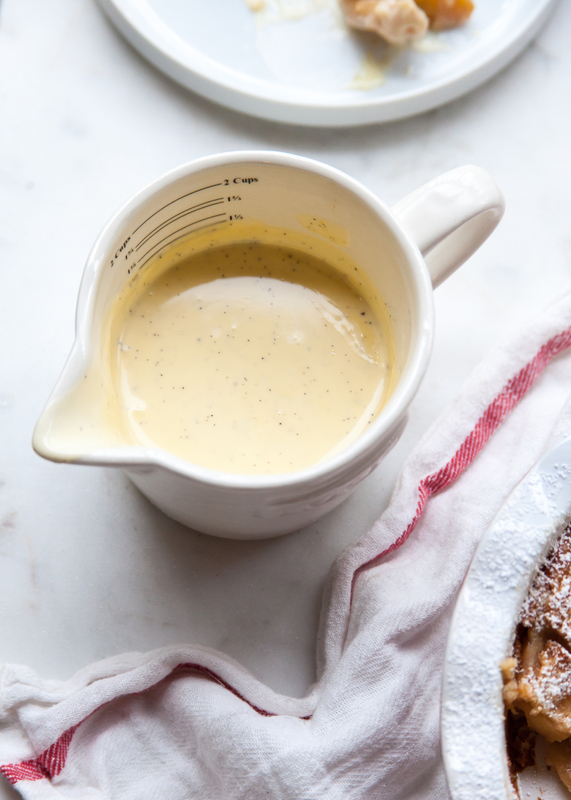 Serve warm or at room temperature with créme anglais and a pinch of cinnamon. In a medium saucepan, heat together the cream, milk and half of the sugar. Add the seeds of the vanilla and het until a light simmer. Meanwhile, whisk together the remaining sugar and egg yolks. Once the milk mixture is hot, temper it into the egg yolks. Return everything back to the saucepan over medium-low heat. Cook for about 2 to 3 minutes, or until the sauce begins to thicken. Strain the créme into a heat-safe container and refrigerate for at least 1 hour before serving. As a recipe developer, I am always looking for a better, easier way to prepare a classic dish or a new, fresh way to incorporate unique ingredients to make something original. This task is fun, but it does have its challenges. How many ways can you make a pumpkin pie, after all? Naturally, this job comes with a lot of experimentation, failed recipes, and flavours that really don't come together. In an effort to be unique and creative, sometimes I go too far and need to reel in the crazy. This goat cheese frosting is not one of those times. It is fabulous! Think about cream cheese frosting. Sweet, fluffy, and so so decadent swirled atop cupcakes, smothered over cinnamon rolls, and obnoxiously layered in a cake before being mounded on top and slathered on the sides. Cream cheese by itself is not sweet, but rather tangy. A simple switch to goat cheese creates a similar frosting, but one that is a bit more refined, less expected, and not nearly as sugary-sweet. Seriously, next time you are making carrot or red velvet cake, try this easy swap! Or with this Cinnamon Caramel Apple Cake, of course. You won't be disappointed. Unlike most other warm-n-fuzzy fall apple treats, this cake is brightened up with sour cream and a dash of cardamon to go with the goat cheese frosting. To top it all off, cinnamon-infused caramel is drizzled and dripped over the top. And if you are into salted caramel sauce (and let’s face it, who isn’t? ), sprinkle with flakey sea salt for an extra punch! Head on over to The Cake Blog for the whole recipe! We survived week 2! After multiple check-ups and a get together with out prenatal group, Baby Boy is thriving! Our sleep routine is getting better and he continues to eat like a champ. Time both slows and flies by with a wee little one. I find myself scanning Instagram and Pinterest more than ever during late-night feedings and am usually showered and dressed (even if in sweats - but clean sweats) earlier in the day than I used to be. At the same time, between appointments, diaper changes, and bath-time, I don't even know where the day goes. Time seems to stand completely still while I am cuddling my son, but my husband and I have strangely found more time in the in between, trying to take advantage of his naps to do the little things like take a shower, unload the dishwasher, and even bake a quick cake. Molly Yeh's fondue game is out of the world. This thought-provoking read by The Faux Martha about inspiration/originality + a decadent chocolate cake. Style Me Pretty Living's Caradamon Rose Cocktail - since Valentine's Day is less than 2 weeks away, I can enjoy a bit of alcohol again, and you know how much I love cardamom. The one-and-only Dorie Greenspan's Custardy Apple Squares - as seen on Food 52 - and remembering when I tried to work my way through Baking: from my home to yours when I first started baking nearly a decade ago. In the daylight hours, I was able to find some time to do some cooking and baking - or at least this week I did. We had some gorgeous weather this past week and were able to squeeze in a few walks to the park and even a trip to the grocery store sans baby. Some friends and family think I'm nuts for baking/cooking with a new baby at home, but for me it's actually relaxing and rewarding - not another chore. I really enjoy baking/cooking (duh- or else why would I even have started this blog? ), I find that in all the chaos of having a new baby at home, I am comforted by being in the kitchen. Where with baby I have so many questions and concerns, in the kitchen I can whip up a cake in 20 minutes and just trust the science behind mixing a couple eggs with some flour and throwing it all in the oven. 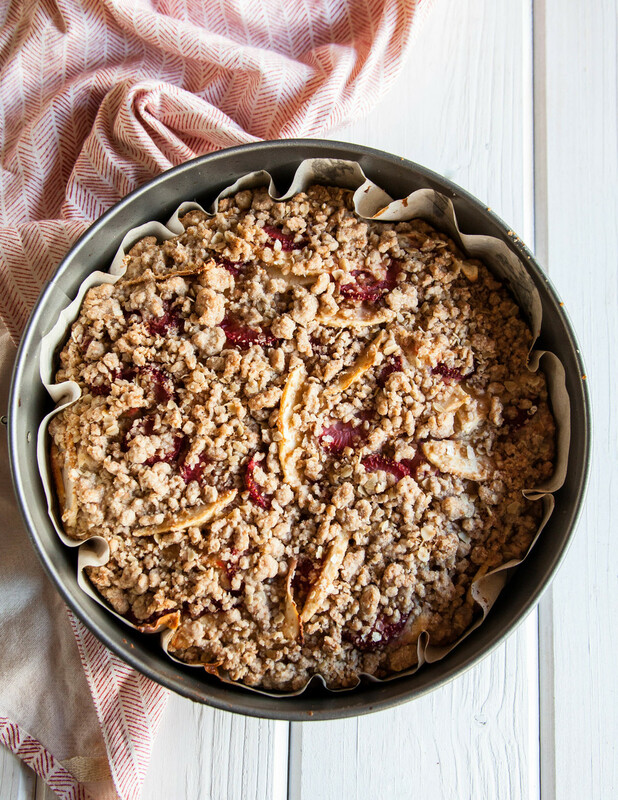 This week's Baking with Baby recipe is this Strawberry Apple Crumb Cake. I wanted to make a quick, sweet treat that would work for a snack and/or breakfast that used up some of the leftover produce in the house. I knew I would not have time for something with multiple parts (cake+ icing + filling, etc), so this single layer tea cake was the answer. Since I do make so many layer cakes, I sometimes forget the amazingness that lies in the simplicity of a single layer cake. Everything baked up in one pan, making less dishes and more time for baby cuddles. The crumble topping was easy enough and would work wonderfully on its own, but a quick stir of some creme fraiche with orange zest and sugar made the for the perfect addition. Yes, there are healthier things I could be snacking on, but the fresh fruit, whole wheat and almond flours, and yogurt made it feel light, fresh, and a bit better for me than other packaged or preserved snacks that are equally easy to grab 'n go with. Did I mention how easy and quick this was to throw together? Just some sifting and slicing while baby naps and you are ready to go. Feel free to add in whatever fruit you have on hand like sliced pears or blueberries! Combine the first 9 ingredients together in a mixing bowl. Cut in the butter between your finger tips until the ingredients start to come together into little clumps. Refrigerate. Preheat oven to 350 degrees. Grease and line a 10-inch spring form pan with parchment and set aside. Add in the sugar and mix on medium until creamed. With the mixer on low starting and ending with the dry ingredients, alternate adding in the dry ingredients and the yogurt. Top with sliced apples and strawberries. Sprinkle top with crumb mixture, leaving some of the fruit to pop out - if desired. Bake for about 45-60 minutes or until done. Cool on a wire rack for 10-15 minutes before removing the cake from the pan. Stir the orange zest, juice, and sugar into the creme fraiche. Place a dollop of cream on each slice to serve. Hey everyone! If you noticed or wondering if I have been a little quiet here on the blog lately, you are not imagining it. I have been working on a few big projects lately. The latest? We are moving! It might just be across town, but we are moving to our very first home. Like, we received the keys and are officially home owners!! It's not like the 4-bedroom house with a yard that I grew up in, but I have never been soooo proud to own 1,000 square feet in one of the best neighborhoods ever. My current apartment is packed to the brim in boxes. I still need to scrub the kitchen and get the carpets cleaned (so excited for hardwood floors in the new place!). I'll sure miss the amazing city view of our little 15th-story "box," but I am very much ready to get out of this building. We will be living in a gorgeous condo just steps to Stanely Park - just recently ranked the best urban back of North America by Tripadvisor, not to brag or anything. Remy girl is going to love walks to the park, around the sea wall, and hanging out at English Bay. Check out the pics on my Instagram. Can't wait for this new adventure!! Bottom line, it will probably continue to be a bit quiet around here until we get settled in. I'll try to unpack the kitchen first, promise. Fingers crossed the oven works!! Until then, please enjoy this Apple Zucchini Muffins. They are perfect for using up the last surplus of summer squash and the first harvest of autumn apples. And they are fairly healthy-ish! 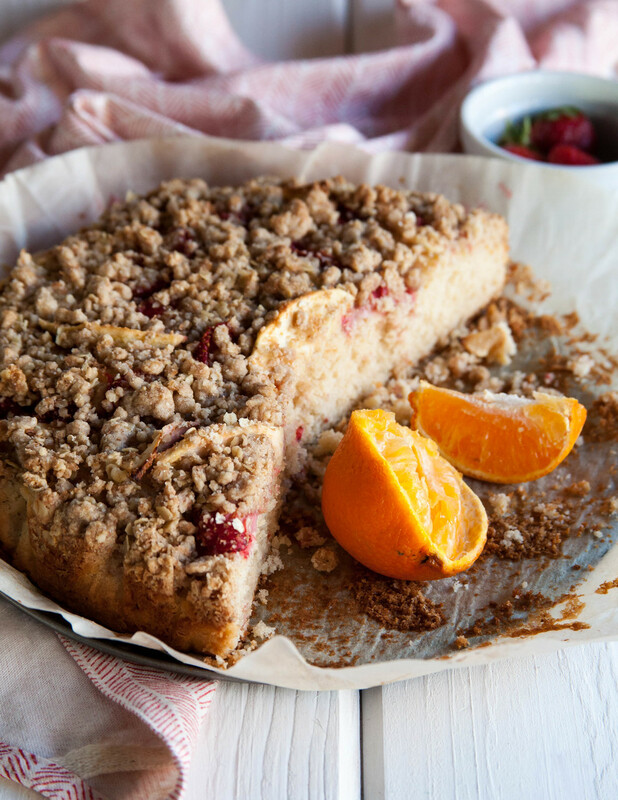 Topped with a cinnamon oat crumble and a side of sweetened creme fraishe, you'll be grabbing these for breakfast or on-the-go snacks - or at least that's how I've been enjoying them all week. Find the complete recipe over at The Kitchn.